VNRE – The Hanoi People’s Committee in coordination with South Korean experts have begun the second phase of a USD7-billion Basic Planning for the Red River Area Development. The Hanoi People’s Committee announced that the second phase of planning was underway November 3, adding that the basic planning will be integrated into the Hanoi Master Plan from now to 2030 with a vision until 2050. Therefore, when the Hanoi Master Plan is approved by the central government, the Basic Planning for Red River Area Development will follow the suit. Then, the latter will be revised in line with zoning plans laid out by the Law on Urban Planning. The committee said the two sides are trying to collect opinions and proposals for the second phase and completing the planning of the first. Once the basic planning is completed, it will be submitted to the Government and the National Assembly for approval. Under the basic planning, the first phase is designed to build up a city by the Red River which will house international financial high-rise buildings and riverside parks. The basic planning will cover 4,200 hectares of land and water surface, stretching 40 km along the Red River running through Hanoi. Up to 39,000 households are expected to have to relocate to serve the plan’s implementation. 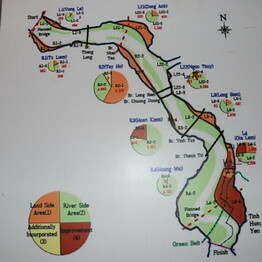 The planning is divided into four zones with the first stretching from Chem (the final point of the plan) to Thang Long Bridge; the second from Thang Long Bridge to Chuong Duong Bridge; the third from Chuong Duong Bridge to Thanh Tri Bridge and the fourth from Thanh Tri Bridge to Bat Trang Commune (the starting point of the plan). Red River designer, originally uploaded by Kiva.Dang. 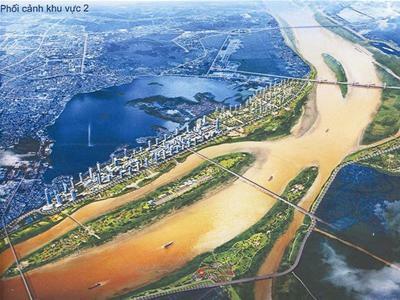 A plan to rebuild urban areas along both banks of the Hong (Red) River in Ha Noi through 2020 will be submitted to the Prime Minister after receiving the nod from the Ha Noi Party Committee conference on Monday. This plan would play a key role in developing 40km of both banks of the Red River towards a modern, civilised capital for the 100 million people living in the country, said Pham Quang Nghi, Ha Noi Party committee secretary. The plan’s estimated cost of US$7 billion will be spent on four development areas, including more than 2,000ha of land for an urban zone, a commerce and trading area, public land and a land fund for international festivals and sports events. 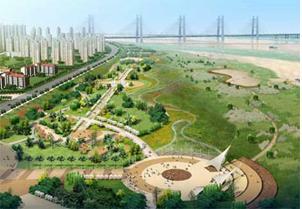 The plan includes flood-control measures based on South Korea’s construction model around the Han River. The plan would ensure floodwater drainage, sustainable socio-economic development in line with environmental protection and a focus on green space, said To Anh Tuan, director of the Ha Noi Planning and Architecture Department. Before being discussed at the conference, scientists, experts and Ha Noi residents all gave their opinions on the plan, said Le Van Hoat, head of the Economic Committee of the municipal People’s Council. If the plan is put into action, the river will be widened under the Thang Long bridge and north of the Chuong Duong bridge. The river will also be narrowed at some sections to ensure it is 4,200 metres across at its widest and 1,300 metres at its narrowest. The readjustment of the river beds would improve flood drainage and make it easier to transport goods and use the river for tourism services, said Tuan. In addition, a new system of stone embankments and dykes would be built to avoid land erosion, said Tuan. Under the plan, 12 environmental and cultural preservation areas and 59 other projects including green space, pedestrian walkways, parking lots, entertainment centres, and a sports stadium will be built along the banks of the Red River. The projects will be integrated and connected with the rest of the city. The urban zones, which will include trade and commercial centres, will be set up in conformity with traditional craft villages. However, the Ha Noi Party committee secretary reminded relevant authorities to be aware of public opinion and consult experts since the plan would have enormous consequences for the 170,000 people who are now living along the banks of the Red River. It would be necessary to have suitable policies to relocate households, Nghi said. About 4,500 households living between Chem and the Thang Long bridge will be relocated by 2012. About 23,900 households living from the Thang Long bridge to the Thanh Tri bridge will be relocated between 2013 and 2016, and 6,700 between the Thanh Tri bridge and the Bat Trang Pottery village from 2016 to 2020. 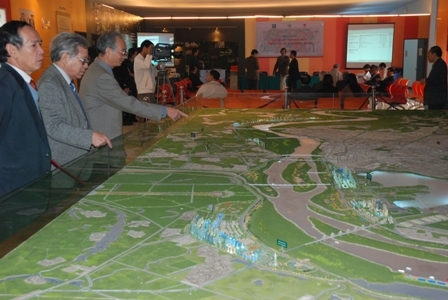 A delegation from the Republic of Korea’s capital city Seoul has visited Vietnam to participate in an exhibition on a basic construction plan for the area along Hanoi’s Red river banks. Seoul Vice-Mayor Choi Chang Sik talks about the plan. Some people have compared the Han river with a polished diamond after Seoul completed the Han river project. Could you please briefly describe the results of this project? The project was completed and brought good results. Although it does not affect 100% of Seoul’s development, it has a great effect on the quality of people’s lives and changes the face of the city. Thanks to water control, there are no longer floods. People’s quality of life has obviously improved. The ecosystem is abundant. The environment around the Han river has remarkably improved. Urban areas and apartment blocks have been built along both banks of the river according to the city’s plan. The system of bridges and highways has brought effective benefits for socio-economic development in Seoul, with 8 lanes on the northern bank and 10 lanes on the southern one. 12 parks along the two banks draw 45 million tourists every year. With the renaissance plan in 2007, the Han river region truly became the tourist, social, cultural and economic center of Seoul and made Seoul become a “port city” in spite of not being on the sea. What do you think about Hanoi’s Red river project? If comparing the Han river region with a diamond which was polished with great care to become jewelry, the Red river is like an unpolished diamond. The improvement will make the future image of Hanoi. I think the project will not only bring direct effectiveness for the infrastructure but also indirect effectiveness such as creating jobs and helping the socio-economic and cultural development of Hanoi. Based on the inheritance of historical and cultural traditions of Hanoi – a city of one thousand years of culture, Hanoi and Seoul will cooperate to carry out the project to develop the city toward international competitiveness and to create a space of living, relaxation and entertainment that is harmonious with nature and friendly with the environment. The Red river region in the future will include a riverside ecological reserve, a general sports park, a historical ecological park, open parks for people, squares, restored traditional villages, buildings, villas, car-parks and entertaining areas. Which experiences will Seoul share with Hanoi? We will share with Hanoi all experiences in implementing the Han river project, including lessons from both success and failure. There will be a flexible combination after studying the specific conditions in the Red river region. For example, it is necessary to predict the effects of flood control works even while building them, especially their effects on environment. Experiences from the Han river plan and development will be applied to completely change the face of the Red river region. They include preventing floods for up to 250 years; and improving dykes and the environment. This will help the region become an international urban area in the future. Which difficulties do you think Hanoi will face when implementing the project? I emphasize that Hanoi needs a great determination and will to reach this goal. It takes much longer than just one or two years. Without the support of the state, Hanoi will not carry out the project itself. Because this is not a local project but a national one in order to change the face of the nation’s capital. We are willing to cooperate with you to implement this project. However, Hanoi also needs to create the best conditions for experts in planning, architecture and construction to learn from experience. In addition, compensation and ground clearance will meet difficulties. There is a need to have a deep understanding of the rights and expectations of local people. To do this, the project will not only direct common development of the city but also ensure the rights of people. The first period of the project was completed. What is your opinion about its initial results? As far as I know, the first period of the project comprehensively assessed the situation of the Red river region, strength and weakness, opportunities and challenges to propose specific tasks that need to be solved. The project considered problems of geography, terrain, meteorology, geology, hydrography; flood rule; socio-economic factors; infrastructure and environmental characteristics. These research will provide a foundation for the following steps of the project. I believe that Hanoi will successfully polish the Red river region into a valuable diamond! A project to build a city along the Red River’s banks has ignited controversy. An architect and a geologist discuss the pros and cons of the plan. I think the idea to build a city along the banks of the Red River is unreasonable. I recently published my feng-shui reasons for this. In 1010, King Ly Thai To chose Dai La Citadel [former Hanoi] to become the capital city because it was where mountains and rivers converge. The project will destroy the feng-shui of Thang Long. But it’s a complicated issue not everyone can understand so here I want to talk about the cultural side to my argument. The second part of the project will involve building more than 100 high-storey buildings on the land along the dike between Ho Tay (West Lake) and the Red River. Architects here all consider this area from West Lake to Co Loa Commune a sacred cultural space. Two thousand years ago, King An Duong Vuong chose Co Loa as his kingdom. Later, after defeating the Southern Han (Chinese) invaders in 939, Ngo Quyen chose it as the capital. Many other kings, like Bo Cai Dai Vuong Phung Hung and Hung Dao Dai Vuong Tran Quoc Tuan won glorious victories against foreign invaders in this river. We think of this area as an altar for our ancestors: a place where we can worship them. But the project planners ignored all this. The plan, once implemented, will not only take away this sacred land but also destroy one particularly special characteristic of Hanoi – its flower villages. Hundred-year old flower and bonsai villages such as Nghi Tam, Quang Ba and Tu Lien lie outside the river dike. If this plan goes ahead they will have to move. I don’t understand why the planners took into account Bat Trang pottery village but ignored these flower villages. We can exploit land outside the Red River but not these places. What will happen to Hanoi if thousands of households, used to making a living by planting flowers and bonsai, are forced to move to high-storey buildings? When researching the possibilities to expand Ha Noi along the two banks of the Red River, we don’t need to talk about whether Vietnam’s river is similar to South Korea’s Han River. But if we say that the two rivers are the same so that Hanoi can expand like Seoul, it wouldn’t be true. In Vietnam, there is another river called Han, its source in the central region’s highland area, flowing to the sea via Da Nang Bay. This river has some similarities to Seoul’s Han River. 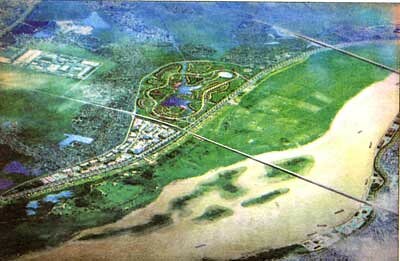 As a result, Da Nang City can develop as other cities along rivers worldwide. But the only similarity between Seoul’s Han River and the Red River is the fact they both have water. Let’s start with the basics. The Red River is 1,149km long, the Han River 514km long. The Hong River rises from China’s Yunnan, running through Vietnam with two tributary rivers Da and Lo, each of which is already of about the same size as the Han River. The annual water level of the Hong River can exceed 122bil cu.m with total alluvia topping 80mil cu.m. This is what the Han River doesn’t have. High sediment levels can cause water levels to rise, posing immeasurable danger when we try to stop and narrow the flow. The Han River, together with Seoul City, lie within a valley surrounded by mountains. Even in the city there are mountains like Imum, Jongam, Acheon with heights from 200 to 300m. The special terrain means Seoul doesn’t need a dike. Meanwhile, the Red River lies in a delta with a synchronous dike system to protect not only Hanoi residents but all those in the river delta. As a result, the development of Hanoi should be calculated with thought to the whole region. But in terms of the Han, South Koreans need only think about the 40km in Seoul. Another difference is the weather. Seoul in January and August ranges between 2 degrees Celsius and 24-26 degree Celsius, respectively. The correlative temperatures in Hanoi are 15 degrees Celsius and 32-37 degree Celsius. The average rainfall in Seoul in winter and summer are 50-70mm and 650-700mm, respectively. Meanwhile the average rainfall in Hanoi in February can exceed 100mm and in the rainy season reach between 900-1,000mm, not mentioning the rainfall in the upper reaches of Bac Quang District (Ha Giang Province), which can be over 3,000-3,200mm. Seoul, as mentioned above, lies within a narrow mountain valley while Hanoi is in a large delta. The geology of Hanoi and Seoul are completely different. Of course, the city planning isn’t just based on the natural conditions. However, the argument that the project will succeed based on the similarities of the Hong River and the Han River is unscientific. Vietnamese people should also be aware South Korea are considering a plan to remove the capital to another place with better conditions. The Red River, together with its vitality and green trees, is the artery of Hanoi. We cannot use it wastefully or against its natural position. This means environmental improvements are vital for areas outside the dike to modernise and improve Hanoi. It’s important that the public have all the available information on this. Following the announcement of an allocation of $4.24 million to help Hanoi to zone the two sides of the Red River, Hanoi and Seoul authorities met last week to discuss the project. With experience in construction on the banks of the Han River, which passes Seoul, the South Korean experts will aid local authorities in devising appropriate developments for the banks of the Red River. According to architect La Kim Ngan, deputy director of the Rural and Urban Zoning Institute, the river will become a central part of the city as development progresses. “For long time the river has been considered one side of the city. Now it will be the centre of the city,” Ngan said. The architect said the most important factor in ensuring the feasibility of the project was an ability to control the flow of the river, which often floods in the wet season. The key requirement should be dyke safety, which will reduce flooding and increase the value of the land along the two sides of the river. “A large land source exploited here can be used to develop urban areas to ease the population density in the centre of Hanoi,” Ngan said. More than 3,000 hectares of land will be used for the development of urban areas in Tam Xa, Giua, Long Bien, Tu Lien, Linh Nam and Tran Phu after zoning. According to the visiting Korean experts, the Han River is similar to the Red River in that it is long and sometimes fierce. However, they said that now that the river is controlled it has become one of the prides of Korea. Seoul spent six years developing the banks of the Han and its riverside precincts now feature 85 kilometres of garden areas, entertainment centres and urban developments. One of the new areas, the Yeoido area, which was built on an island in the centre of the river similar to that in the middle of the Red River, has become the city’s political centre. According to the agreement between authorities from the two cities, the project have been implemented over 16 months from July 2006. According to a report from the Hanoi People’s Committee, more than 170,000 people live in the 10,000ha along the banks of the Red River. The area includes 27 communes in Ba Dinh, Hoan Kiem, Hai Ba Trung, Hoang Mai, Long Bien, Gia Lam and Thanh Tri districts. The section of the Red River to be developed stretches for 40km from the Thang Long Bridge to Khuyen Luong Port.